With its interesting texture and organic appearance, paper raffia has become a must-have for wrapping gifts, lining gift boxes and baskets, embellishing floral arrangements and as rustic accent for handmade cards or scrapbooking. Jillson Roberts Eco Paper Raffia is made from 100% biodegradable paper, is chlorine and bleach free and is colored using water-based dyes. Unlike most natural raffia, paper raffia unrolls without knotting, isn't prone to splitting or breaking and can easily be cut to any desired length. 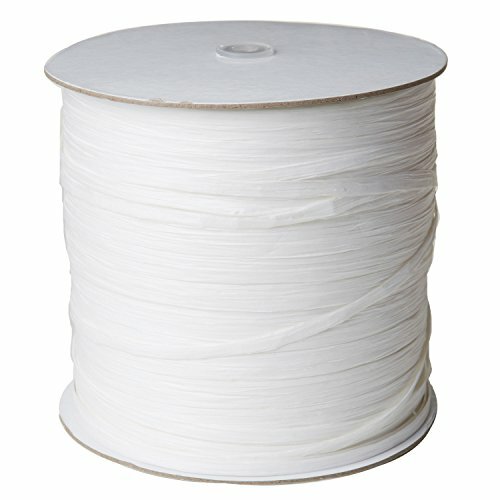 Each bulk spool contains a whopping 1000 yards of 1/4-inch wide paper raffia that's ideal for just about anything for which you'd use standard ribbon. All Eco Paper Raffia is designed to happily mix and match with Jillson Roberts recycled gift wraps, wine and bottle bags, ribbons, crinkle shred and colorful Tyvek padded mailers to let your unique special occasion style shine. Jillson Roberts is proud to offer the largest, most comprehensive presentation of eclectic and environmentally sensitive paper products available on the market today; proof that one can, indeed, give beautifully and responsibly. Jillson Roberts offers a beautiful selection of environmentally sensitive wrap for a wide range of occasions, wine and gift bags, tissue, curling ribbon, Tyvek designer mailers and more are available. View More In Paper Ribbon & Raffia.